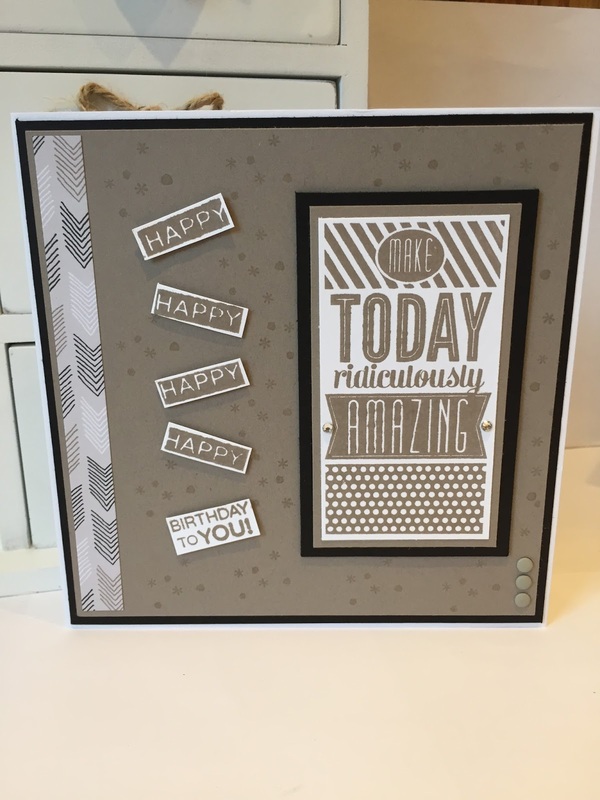 Tracy Abrahams : Super Speedy Male Card Using Amazing Birthday from Stampin' Up! Super Speedy Male Card Using Amazing Birthday from Stampin' Up! I wanted to make a super quick card for a young man who's birthday was yesterday so Amazing Birthday from Stampin' Up! fitted the bill. Such a lovely stamp set as it can be used for either male or female cards. As you can see I used Basic Black and Tip Top Taupe as the base colours with a little strip of Go Wild Designer Series Paper. The Amazing Birthday stamp set is so cute as you can cut up the Hello sentiment to make little banners. You may be wondering what the background stamp is well it's a little stamp from the Perpetual Birthday Calendar Stamp set. I made the card 6 x 6 I like this size and use it quite a lot when I'm crafting with large sentiment stamps as it gives me plenty of room to play. I really like the way the card turned out and I hope you like it to. I have listed all the supplies used below so if you wish to purchase anything simply click on the item and it will take you straight to my online shop and the item you would like to buy. Please don't forget to use my monthly Hostess code JSPDPQBV if you spend over £20 to receive a FREE thank you gift and card. Please tick contact so I know where to send the gift.